Spring Silkworms (Chun Can). Directed by Cheng Bugao. Shanghai: Mingxing Film Company. 1933. 96 min. The Goddess (Shen Nü). Directed by Wu Yonggang. Shanghai: Lianhua Film Company. 1934. 85 min. The Big Road (Dalu). Directed Sun Yu. Shanghai. 1935. 104 min. The Red Detachment of Women or The Female Red Detachment/Hong Se Niang Zi Jun. Dir. Xie Jin. Beijing Film Studio. 1961. 105 min. Judou. Directed by Zhang Yimou. Beijing: China Film Co-Production Corporation, China Film Release Import and Export Company, Xi'an Film Studio; Japan: Tokuma Shoten. 1990. 95 min. Twentieth-century Chinese cinema can serve as a valuable teaching tool for students to understand Chinese politics, culture, and society through the image of the Chinese woman. Female characters in the melodramas mentioned here play important roles as signs of some of the significant upheavals China has undergone in the twentieth century. These figures express pain and suffering, embody political ideologies, and highlight questions about the government. Early Chinese silent films of the 1920s and 1930s vividly portray Chinese experiences during the upheavals of the Republican period. Melodramas such as Spring Silkworms and The Big Road featured a bleak and tragic nation, and were released at a time when China was suffering from political, economic and environmental turmoil and when mass poverty and hardship were common. During this period, women in films came to be viewed as symbolic of Chinese suffering. For example, the 1934 film The Goddess featured the tragic story of a nameless woman who resorts to prostitution and manslaughter in order to protect her son; she is metaphorically equated with a goddess through the strength of her suffering. This on-screen tragedy is given further poignancy by the heart-breaking real-life story of Ruan Lingyu, the film's lead actress. Known as the �Chinese Garbo,?Ruan was China's biggest movie star in the early 1930s, but committed suicide a year after the release of The Goddess, when she was only 24 years old. The victory of the Communists and the establishment of the People's Republic of China in 1949 brought fundamental political changes in Chinese government and society. Thereafter, the Chinese film industry only produced state-sanctioned propaganda films, used as tools for domestic socialist education throughout the Maoist era (1949?976). During this time, female characters were used as a political focal point for promoting Chinese government propaganda, which intensified during the traumatic period of the Cultural Revolution (1966?976), and, as a signifier for prevailing political ideology, can thus be used to demonstrate the political upheavals China has experienced under Communist rule. In the socialist system of China, the figure of the woman was transformed from a �ghost of [the] old society?into a �master of the new state,?and is used as a symbol for socialist education; women in the films were created as �constructions for/by the state,?as Shuqin Cui argues in her book Women Through the Lens. During the Cultural Revolution, women were relieved of their traditional position of Confucian servitude and were told that they were able to �hold up half the sky. ?However, while women were emancipated by the socio-political collective ideology, they also experienced gender erasure. In The Red Detachment of Women, for example, the figure of the sexless woman is politicized for the purpose of spreading socialist propaganda. he film narrates the story of peasant girl Wu Qinghua who discards Confucian ideals of femininity for socialist equality. The Red Detachment of Women serves as a metaphor for the Cultural Revolution's aim of reinventing Chinese culture by eliminating tradition and replacing it with socialist principles for the greater good of a China reborn. The films of the post-Maoist period, however, present a new form of Chinese cinema that critique rather than support the ideals of hard-line socialist reform that guided the Cultural Revolution. In the 1980s and 1990s, the melodramatic films of the �Fifth Generation?filmmakers (as they were dubbed in the West) such as Zhang Yimou reflected strong anti-Chinese government politics. This was a period of ideological change, when China was opening its doors to the international community, including an inflow of information and an outflow of people to study abroad. The open door policy also led China to embrace capitalism and liberalize its economic policy. The social, cultural, political, and economic changes China underwent in the post-Maoist period brought about inevitable changes in Chinese cultural production. 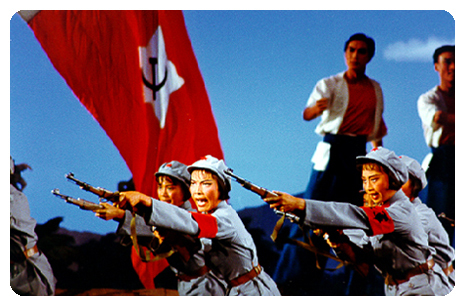 Even though most of their films were banned in their homeland, Fifth Generation filmmakers took advantage of the post-Maoist period to criticise the Chinese government and its role in the Cultural Revolution. The figure of the woman in Chinese cinema thus unsurprisingly took on a different political complexion compared to the Maoist era. While the Fifth Generation films have narratives that are ideologically different from the socialist-education films sanctioned by the Chinese government, they still use the figure of the woman to express their politics by recuperating the pre-Cultural Revolution symbol of the Chinese woman, providing her with a sexualised and gendered identity. It is in this paradigm of gender that the Chinese government is portrayed as dominant and oppressive, and understood as villains within a memory framework of the Cultural Revolution. In Judou, as in other Zhang Yimou films of the period, the female character is sexualized yet strong, independent and passionate. The strength of the protagonist Judou, played by Gong Li, is emphasized as she faces off against patriarchal authority, as represented by her abusive husband. Patriarchy functions as a metaphor for the Chinese government and its role in the Cultural Revolution. The figure of the tragic woman, a powerful signifier of twentieth-century Chinese circumstance and history, is an excellent teaching tool for understanding the complicated social, cultural, and political development of contemporary China. Students learn that Chinese cinema uses the archetype of the strong yet tragic woman in melodramas to represent the colossal events of trauma and change that helped shape modern China. Catherine Gomes is a lecturer at the Royal Melbourne Institute of Technology (RMIT) University in Asian media and culture. She has written in the areas of Asian transnational cinema, gender and ethnicity. Spring Silkworms (Chun Can): Available for purchase Amazon for $20 (also available from YesAsia without English subtitles, region 6, for $7). The Goddess (Shen Nü): Available for purchase from Amazon for $20 or for free to download or stream at the Internet Archive. The Big Road (Dalu): Available for purchase with another silent film, Queen of Sports, from Barnes & Noble, Amazon, or YesAsia for approximately $25 or for free to download or stream at the Internet Archive (note: Queen of Sports is also available for free to stream or download at the Internet Archive). The Red Detachment of Women or The Female Red Detachment/Hong Se Niang Zi Jun: Available for purchase from YesAsia for $10 (also available from Amazon for $20) or for free to download (in two parts) or stream from the Internet Archive. Judou: Available for purchase from Barnes & Noble for $17 (also available from YesAsia without subtitles or English audio track for $7).